You Got Us to 500 Million! Here’s 30% OFF & 2 New German Study Tools for You. You’ve helped us reach 500 million lesson downloads! 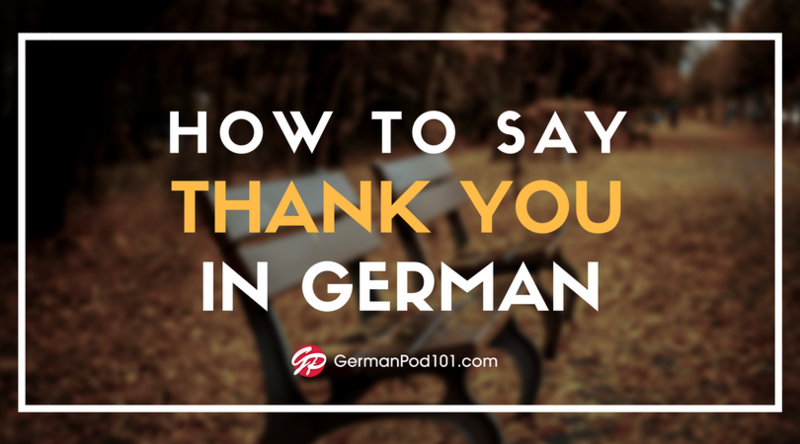 As a thank-you, we’d like to help you master more German for LESS. Get 30% OFF any Premium or Premium PLUS plan – that’s just $7/month or $0.23/day. You get unlimited access to 160+ hours of lessons, study tools and apps. With Premium PLUS, you can even learn 1-on-1 with your own teacher. Hurry! This ends October 2nd, 2015! 2. Never Forget German Words Again with the NEW Word Bank. Here’s how you easily remember the German you learn in our lessons. Read while along listening! Using two senses at the same time keeps you focused and engaged so you learn twice as fast. With the new Lesson Transcripts, you get the entire transcript from our teachers – the dialogue, their explanations, tips and sample sentences – from beginning to end. If you’re a Basic or Premium member, find the transcripts in the Lesson PDFs of any lesson. To mastering German with fun and easy lessons! P.S. 3 Days Left! Learn German at 30% OFF with lessons by real teachers. 500 million lesson downloads don’t lie. You’ll start speaking German from your first lesson and quickly move on to mastering practical conversations. But the only way to start speaking German and SAVE is to take action and unlock our proven system. Get 30% OFF any Premium or Premium PLUS plan – just $7/month or $0.23/day – ‘til Friday, October 2nd, 2015. Where will your German be in 6 months? Successful students start now and don’t leave learning German to luck. So, when 2016 comes and most are just starting on their German goals, you’ll be 6 months ahead. With the 6-Month Challenge, you also get exclusive Inner Circle membership – tested learning methods and strategies for mastering German – to make sure you smash your learning goals. There’s even a BIG 45% discount! Ends Friday! Click Here to Learn German in 6 Months for $66! 1. Ends Friday! Learn German in 6 Months with a BIG 45% Discount! Learn to speak and understand German with real lessons from real teachers. Grab 6 months of Premium for $66 – that’s a BIG 45% OFF. Unlock the ENTIRE learning system – 160+ hours of audio and video lessons, PDF lesson notes, mobile apps, Premium tools and exclusive Inner Circle access! Get $54 in savings ‘til this Friday, June 26th, 2015. Click Here to Get a BIG 45% OFF and Learn MORE German for LESS. How do successful German learners stay motivated and smash their goals? Welcome to the Inner Circle – an exclusive newsletter with audio lessons and PDF notes. You learn tested learning methods and success strategies that turn you into a consistent, high-performing German learner. The Inner Circle comes out at the end of every month (the next one is June 30th) and is for Challenge subscribers ONLY. If you’d like to join, take advantage of the 45% OFF to enroll. Learning German with the App? This past month, there were two new updates that you should know about. First, video lessons are finally on the Android App. That’s more lessons for you. And the iPhone and iPad version? It has powerful lesson player controls. Slow down the German that you hear, jump 10 seconds ahead or back, put your lessons on repeat and much more. 4. Ready to Master German with New Audio & Video Lessons? 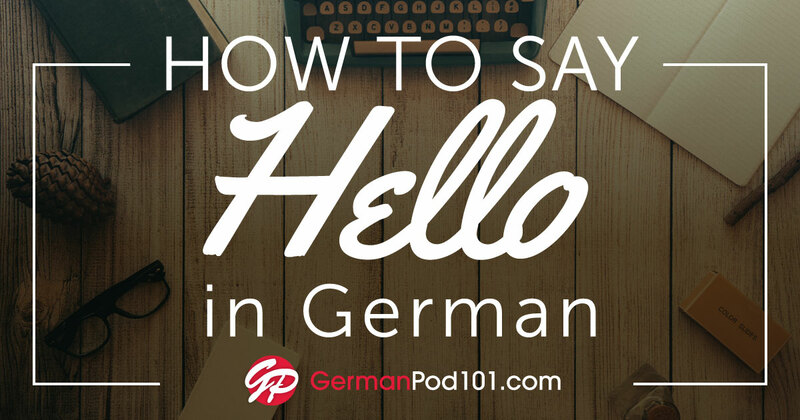 Here’s how you master more German in 2015 – with brand new GermanPod101 lessons, every week. Starting July 6th, 2015, we’ll be publishing new seasons and lessons. They’re all made by real teachers and all designed to get you speaking and understanding more German. So, what’s new at GermanPod101 and what lessons can you expect? Click here to see the GermanPod101 publishing schedule for 2015. P.S. Ends Friday! Learn German in 6 Months with a BIG 45% Discount! Time’s running out to get a BIG 45% OFF 6-Month Premium! Master German with the biggest discount of 2015. Unlock ALL GermanPod101 lessons (new lessons published weekly), PDF lesson notes, Premium tools, mobile App access, PLUS the exclusive Inner Circle newsletter! Just $11/month and $54 OFF! Ends Friday, 06/26/2015. This is a Pretty Big Deal. Why? New Free German Lessons, 31% OFF and more! How do people get better at German? Brainpower? Sure, that helps. But, there’s nothing stronger than pure consistency of time and effort. Sticking with German and doing new lessons – so, with time and effort alone – you’ll massively improve your German. That’s why we’re talking about 2 features that track time and effort and give you new lessons all the time. Oh, and there’s a Pretty Big 31% OFF discount that expires soon! Discount Ends Friday! Click here to learn German for just $6.90/month! 1. Ends Friday! Learn German with a Pretty Big Deal – Get 31% OFF! Now’s the time to learn German with real lessons by real teachers. Get a BIG 31% OFF – up to $74.40 OFF – Premium. Unlock the largest library of audio and video lessons in the world and much more. Over 160 Hours of Lessons, Lesson Notes, Study Tools, New Weekly Lessons and Exclusive Apps! Just $6.90/month to master German. Hurry! This ends Friday, 5/29/2015 and prices will go back up. 2. New App Update! Get the Latest German Lessons for Free on the App! You asked. We listened. Innovative Language 101 for the iPhone, iPad and Android has a new update: Newest Lessons. 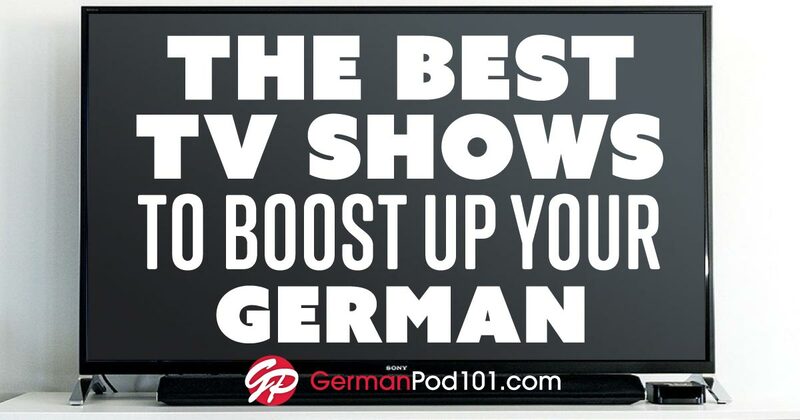 With this, you get access to new GermanPod101 audio and video lessons EVERY week, for life! So your German will only get better. And if you want to master German with our entire learning system at a big discount, get 31% OFF with the link above! Einstein once said “It’s not that I’m so smart, it’s just that I stay with problems longer.” So the only thing between you and mastering German is time and effort. And My Report, a new feature, tracks the time (time studied) and effort (lessons and flashcards completed) you’ve put into learning German. Why? Time and effort will ultimately dictate your German success. So, the more you put in, the better you get. Click here to visit My Report at GermanPod101! P.S. Ends Friday! Master German with a Pretty Big 31% OFF Discount! Want to learn German with real lessons by real teachers? Get a Pretty BIG 31% OFF Premium and unlock our entire earning system 160+ Hours of Lessons, Lesson Notes, Study Tools, New Weekly Lessons and Exclusive Apps! Just $6.90/month to start mastering German. Hurry! This exclusive discount ends Friday, May 29th, 2015. 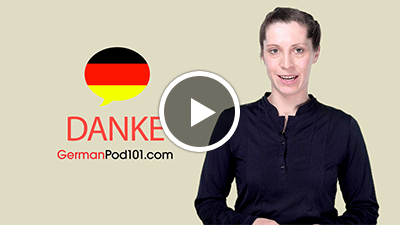 Ready for New GermanPod101 Features, Free Vocab Lists & a Big 28% Discount? First of all, thank you for listening to GermanPod101 lessons and learning with the Free German Vocab Lists! We’ve read the replies and are glad to hear you’re improving. Now, are you ready for more? Then get set! There’s a new GermanPod101 feature called My Report. There’s the Ready, Set, Speak German 28% discount on our entire learning system. And a free feature that just keeps on boosting your German vocab! Ends Friday! Learn German at 28% OFF Any Basic or Premium Plan! 1. Ends Friday! Ready to Speak German? Get 28% OFF Basic & Premium! Ready to start mastering German? Learn with real lessons from real teachers. Get 28% OFF Basic or Premium and unlock 160+ hours of audio and video lessons, lesson notes, study tools, exclusive apps and more! That’s as low as $2.88/month for our entire learning system. Take advantage now because this deal expires Friday, May 1st, 2015. Ends Friday! Click here to get 28% OFF any GermanPod101 subscription! Einstein once said “It’s not that I’m so smart, it’s just that I stay with problems longer.” So the only thing between you and mastering German is time. And now, there’s a new feature out that tracks the time and effort (flashcards studied) you’ve put into learning German at GermanPod101. This is crucial for motivation. Why? Like Einstein said, time and effort will ultimately dictate your German learning success. That’s it. So, how much time have you spent learning German? New! Click here to visit My Report at GermanPod101! 3. Master New German Words with “Free German Vocab Bonus” Emails! Noticed a “Free German Vocab Bonus” email in your inbox? It’s a fast way to boost your German vocabulary. These lists are based on holidays, current events and all-round useful things like Top 10 Conversational Phrases. Review with definitions, sample sentences and audio pronunciation. If you’re a Premium member, add them to Word Bank or My Flashcards to save, review and master them fast! Click here to learn with Free German Vocab & Phrase Lists! P.S. Ready to Speak More German? Get 28% OFF All Basic & Premium Plans! Start mastering German with effective German lessons from real teachers. Get 28% OFF our Basic or Premium plans and unlock 160+ hours of German audio and video lessons, study tools, apps and more! That’s as low as $2.88/month. But you must hurry! This exclusive discount ends Friday, May 1st, 2015 at midnight (EST). Ready to speak more German? Click here to get a BIG 28% OFF ANY plan! What’s the one big thing that’s been going on this month? TONS of feedback about the Innovative Language 101 App! That’s right, the App that gives you ALL of your GermanPod101 lessons on the go. Want to know what other users are saying? Read the reviews below – and get the App for free if you haven’t. Oh, and don’t forget that our All-Access Pass Sale ends Friday! If you want All Access to our proven German learning system, be sure to take advantage. 1. Ends Friday! Get 25% OFF! Master German with the All-Access Pass! Want an ALL-ACCESS PASS to ALL the German lessons, study tools and exclusive apps you’ll need? Get 25% OFF Basic, Premium or Premium PLUS. Master German with 160+ hours of audio and video lessons from real German teachers and more! As low as $3/month to learn German. Hurry, this All-Access Pass Sale ends 3/27/2015! Click Here to Get Your 25% OFF All-Access Pass & Learn German! After we launched the promo video for the App last month, reviews started coming in! Thank you for your support and feedback! Below are just a few comments taken directly from the App review section. And, remember, if you want complete access to ALL the GermanPod101 lessons on the go – at 25% OFF – take advantage of the All-Access Pass above! Extremely helpful in learning German. I’m currently still in the survival phrases - Nathan L.
It’s only through your feedback that we can create effective tools and lessons that help you master German in the fastest, easiest and most fun way! P.S. Get 25% OFF Any Plan! Master German with the All-Access Pass! Ready to master German? This is the ALL-ACCESS PASS to the German lessons, study tools and exclusive apps you’ll need! Get 25% OFF Basic, Premium or Premium PLUS. You unlock over 160 hours of German audio and video lessons and our entire learning system! As low as $3/month and up to $137 in savings! Ends 3/27/2015! Ends Friday! Click here to get 25% OFF All GermanPod101 plans! What’s up at GermanPod101? 28% OFF, Free Audiobook, Our Top Rated App & More! It’s that time again – monthly newsletter time! Here’s a quick two-minute update about what’s going on at GermanPod101. What’s inside? There’s an exclusive 2-for-1 Bundle offer – access to our ENTIRE German learning system PLUS a FREE audiobook – that ends Friday. There’s a new video for the Innovative Language 101 App. Oh, and a free feature that teaches you new German words every day. Keep on reading to learn more! Bundle ends Friday! Get 28% OFF & a FREE German audiobook! 1. Ends Friday! Learn German at 28% OFF & get a FREE audiobook! Want to master even more German? Here’s your chance with this exclusive 2-for-1 Bundle. Not only do you get our German learning system, but you also get a German audiobook! Get 28% OFF Basic or Premium and a FREE 6.5-hour audiobook! Unlock our effective German lessons, lesson notes, exclusive apps, study tools and more! Just $2.88/month with Basic or $7.20/month with Premium. Hurry! Ends 2/27/2015! Click here to learn German at 28% OFF & get a BONUS audiobook! 2. Learning German On the Go Yet? Check Out the App & Video! Imagine if all of your German lessons were available at the swipe of a screen…all so you can learn German whenever and wherever. Want to know how it works? Check out the quick promo video at the link below and download Innovative Language 101 for free! And stay tuned because new App features (new lesson notifications and player enhancements) are coming soon! If you want complete GermanPod101 lesson access, take advantage of the Bundle Sale above! This is one of our listeners’ favorite features. Why? It takes nothing to learn one German word a day. You get a word delivered directly to your inbox. You get its meaning, audio pronunciation, picture and sample sentences. Soon enough, you’ll realize you can learn more! That’s when your German will snowball and you’ll start mastering more. That’s the power of starting small. Subscribe to the German Word of the Day below! P.S. Ends Friday! Get a BIG 28% OFF & a FREE German audiobook! Double up your German progress with this 2-for-1 Bundle! Get 28% OFF Basic or Premium and a FREE German audiobook. Just $2.88/month with Basic or $7.20/month with Premium. Get ALL of our best German lessons, lesson notes, study tools, apps and more! Ends 2/27/2015! Hope you’re not too tired from smashing your German learning resolution and just generally being awesome (you are pretty awesome). We wanted to swing by and quickly update you on what happened this month. We’ve got new lessons, new vocab lists and some awesome free features! Keep reading to find out how you can upgrade your German in 2015. New Lesson Schedule! New Weekly GermanPod101 Lesson! 2. 2015 Lesson Schedule: New German Lessons for the New Year! Ready to take your German to a new level? New lessons started on January 5th, 2015 and they’re sure to improve your German and have you making progress throughout the year. Get a sneak peek at the upcoming lessons at the link below! Remember, all new lessons are free for 3 weeks. Click here to see the 2015 lesson schedule at GermanPod101! Good news! We’ve made My Account, where your subscription and account details are set, all shiny and new. Looks aside, there are some snazzy things you can now do. Want to change your username? You can easily do it in the Account Info section of My Account. Want to add a picture of yourself? Add it with Gravatar. It’ll show up in the comments that you leave around GermanPod101! But this is just a small update, and even more is coming soon! The year’s about to come to a close. While you were improving your German, we were busy churning out great new updates, features and lessons. 2014 was a fantastic time to learn language with us. Innovative Language 101 App launched for the Android, iPhone, iPad & Kindle Fire so you can learn German on the go. New Features: Vocab Lists, Season Vocabulary & Premium PLUS My Teacher tool for 1-on-1 German learning at GermanPod101. 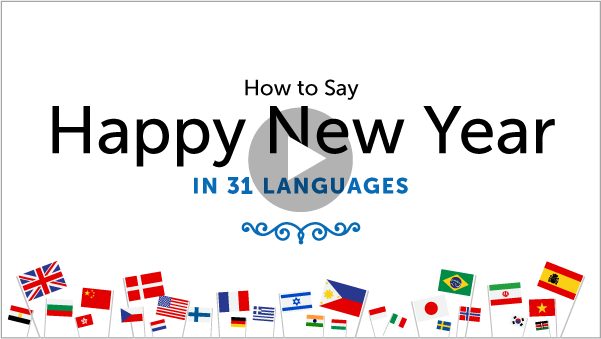 As our final thank you to you, dear listener, we’ve included 3 gifts inside this December Newsletter: a New Year’s video lesson, a Top 10 New Year’s Resolutions in German phrase list and the Newly upgraded Core Word Lists. 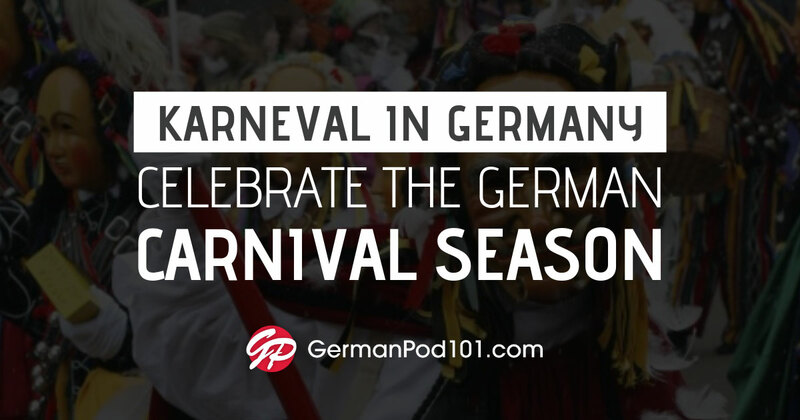 Click here to get your 3 New Year’s Gifts from GermanPod101! Thank you for learning German the fast, fun and easy way in 2014. Starting in January 2015, we have EVEN MORE free lessons, gifts, giveaways and new features for you. From all of us at GermanPod101 and Innovative Language Learning – including our lesson writers, hosts, teachers, editors, customer care representatives and technical staff – we wish you and your family a safe, happy and healthy New Year! Happy New Year! Click here to get your New Year’s Gifts from GermanPod101! We’re one day away from Thanksgiving, our favorite American holiday of the year! So, in the spirit of the holiday, we’re giving you Thanksgiving Treats: a FREE Holiday Video, a Thanksgiving Word List and…final 30% savings on Basic and Premium to learn German after your turkey dinner. Keep on reading to grab your Thanksgiving treats! Last Chance! Learn German with 30% OFF Basic and Premium! 1. Ends Tonight! Get 30% OFF Basic or Premium at GermanPod101! Want to learn German with Basic, our most affordable plan, or Premium, the fast track to fluency? Choose from 1, 3, 6, 12 or 24 months and speak German from your first lesson! At 30% OFF, Basic is as low as $2.80/month and Premium is as low as $7/month. Unlock ALL Lessons, ALL Lesson Notes, Exclusive App Access, Learning Tools and much more. Hurry! Ends tonight, 11/26/2014! Ends Midnight (EST)! Click here to Save Up to $72 & Learn German! Thanksgiving will be celebrated tomorrow in the United States, and there’s no excuse for skipping your German Thanksgiving vocabulary practice. If you want to talk about Thanksgiving in German, these words are a must-know! Review the words, listen to the audio pronunciation and see how they’re used in sample sentences. Click here to get your FREE German Holiday Word List Now! P.S. Final Day! Get A Free Gift & 30% OFF at GermanPod101! Get a BIG 30% OFF Basic or Premium & a FREE Gift as our way of saying thanks! Master German for as low as $2.80/month with Basic or $7/month with Premium! ALL Lessons, ALL Lesson Notes, Exclusive App Access, Learning Tools and more are yours! And you get the “31 Ways to Say Thank You!” video lesson as a gift. Hurry, this ends tonight at midnight (EST), November 26th, 2014. 300 Million Lessons Downloaded, Our Top German App, 30% OFF & a FREE Audiobook! So much has happened this past September! Firstly, you helped us reach 300 million lesson downloads. This massive number starts from our inception back in 2005 and is a huge milestone. It means the lessons work and it motivates us to keep going. So, thank you for downloading, for learning and for your support. We’re happy to see your German grow. 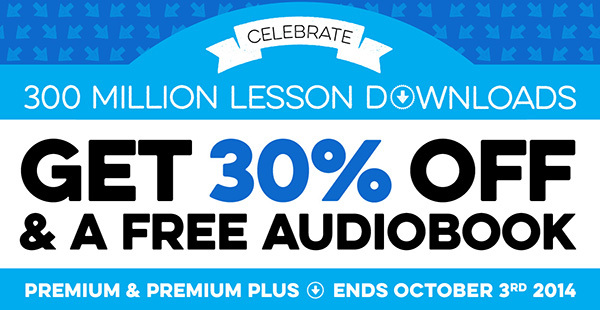 On top of that, there’s a new Premium PLUS feature out, and of course, the 300 Million Celebration 30% OFF + FREE Audiobook deal! Are you learning German on the go with our top App yet? Celebrate the 300 Million milestone with us and master more German! Get 30% OFF any Premium or Premium PLUS plan to FREE German Audiobook! That’s as low as $7/month or $0.23/day and unlock unlimited access to over 150 hours of German lessons, study tools, apps and your own personal teacher. Oh, and the FREE Audiobook! Hurry, this 2-for-1 sale ends October 3rd, 2014! Ends Friday! Click here to learn German for just $7/month or $0.23/day! Are you a Premium PLUS user? Great news! You now get direct 1-on-1 access to your German teacher via GermanPod101. Simply click on “My Teacher” in the upper right corner of GermanPod101 for any German question or problem you’ll ever have! You can also take this feature on the go with your mobile device! Not a Premium PLUS user and want this feature? Take advantage of the 30% OFF sale above! 3. Reminder! Learn German on the go with our Top German App! Are you learning German on the go yet? All of your German lessons are available at the swipe of a screen with the Innovative Language 101 App! Thousands of GermanPod101 members have joined in and the reviews are overwhelmingly positive! The App’s available for Android, iPhone, iPad or Kindle Fire and if you want to unlock mobile Premium access, take advantage of the 300 Million Celebration Sale! 300 Million Lessons downloaded and we couldn’t have done it without you! So, join the 300 Million Celebration! Get 30% OFF Premium or Premium PLUS AND a FREE German Audiobook! Unlock our entire German learning system and master German for as low as $7.00/month! Ends this Friday, 10/3/2014!